All transactions are safe and secure with a reliable history in online purchasing behind each of our associates. 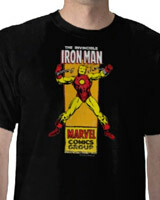 Buy the Iron Man Breaking Chains t-shirt to own Iron Man clothing and merchandise. Wear this retro Iron Man design to break the chains that bind you just like Tony Stark breaks free of his captors after fashioning his Mark 1 armor with the help of physicist Ho Yinsen, a fellow prisoner who dies during Iron Man's escape. The Mark 1 armor is nearly destroyed after Tony Stark safely evades his captors and crash lands in a vacant area of the desert. With no time to salvage the Mark 1 costume, he leaves it behind. His former captors eventually discover the armor and the blueprints for its design, which land in the hands of Obadiah Stane. In addition to the Iron Man Breaking Chains tee above, browse the Iron Man Clothing Gallery for more apparel like men's and women's clothes, kids shirts or hoodies.